The British institute of professional dog trainers was founded in 1974 in order to compile a register of persons eligible to practice as professional dog trainers. This meant that the dangerous dogs register was needed to monitor and control any animals that acquired certain skills but were not in the correct state of mind to work. Prior to 1974, security dogs were a lot rarer, therefore of the first sets of security dogs were lower in quality than those that we are used to seeing today at football matches and other events where high profile people may be. Security dogs can be needed for many reasons, but they are only ever effective when under the control of fully trained and qualified security dog handler. The skills needed to become a security dog trainer are not easily acquired, and certain qualifications are essential before any person can practice as a security dog trainer. To become a security dog trainer a person must either complete a course held at an accredited training centre or pass an exam on the patrol dog training scheme. Temperament. This includes appearance and general condition of the dog. A well kept and good looking dog will always command more respect than a scruffy, unhealthy looking dog. Control. It is imperative that the handler be able to exercise complete control over the dog. Security work carries with it huge responsibly. 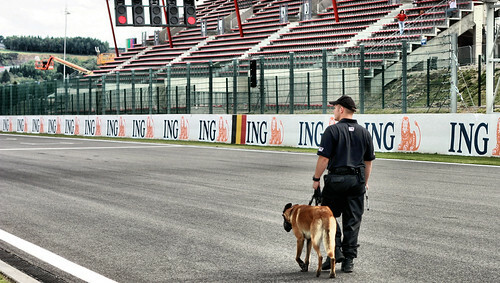 Security personnel cannot afford to have a dog in which they do not have complete trust. This is why it is essential for the handlers and trainers to develop a good bond with any dog they work with. Potential security dog handlers will be required to demonstrate their control skills by completing five tasks. The dog must respond to ‘stay’, ‘heel’, ‘sit’ and ‘stay’, he must remain calm when the handler talks to a stranger, he must be able to get in and out of a patrol vehicle. He must also know how to get through a doorway in the quickest and most efficient way. The handler must be able to pick up the dog and carry him for ten paces. Agility. This will constitute the dog having to successfully negotiate a hurdle jump and a solid wall jump. This can be done on or off the lead. Basic detection and protection. This will involve an exercise in which an ‘intruder’ has to be tackled by the dog under the instructions of his handler. This is a good opportunity for the judges to see if the handler has a natural talent for training dogs. Oral examination. This is when the examiner checks to see if the potential trainer is aware of the legal responsibilities he has as well as the veterinary issues he will need to be aware of in order to look after his dog properly. He will also be expected to fit a muzzle on the dog correctly.